Laura Johnson; Distiller & Founder @ You & Yours Distilling Co. Occupation: Distiller & Founder @ You & Yours Distilling Co.
How long have you lived in San Diego? I moved here around eight years ago. What do you think San Diego does better than other cities? Lifestyle. The quality of life here is so rich. Very relaxed and laid back. Always something to do, somewhere new to eat, some excuse to get outside, etc. etc. We're also so close to mountains, beaches, the desert, and Tijuana, Baja, Mexico etc. I don't drive a whole lot as my home and distillery are both conveniently located downtown but when necessary, driving is my go to method of transportation. The Amtrak or Coaster are great for heading to North County for dinner and drinks - no one has to worry about driving home. Kate Sessions Park. high on the hill to the north of the city, it has gorgeous views of Mission Bay, San Diego Bay, the beach and downtown skyline. What is your favourite building in San Diego? I love the Peace and Justice Building at my alma mater, The University of San Diego. The reflection pool, specifically. I also love Santa Fe Depot. I can see it from our little balcony at home, and it also houses one of my favorite museums in the city. Where do you consider to be San Diego's most underrated location that more people should visit? Loews Coronado Bay Resort. Fairly far south on the Coronado spit, the bay front hotel looks back at the San Diego skyline. 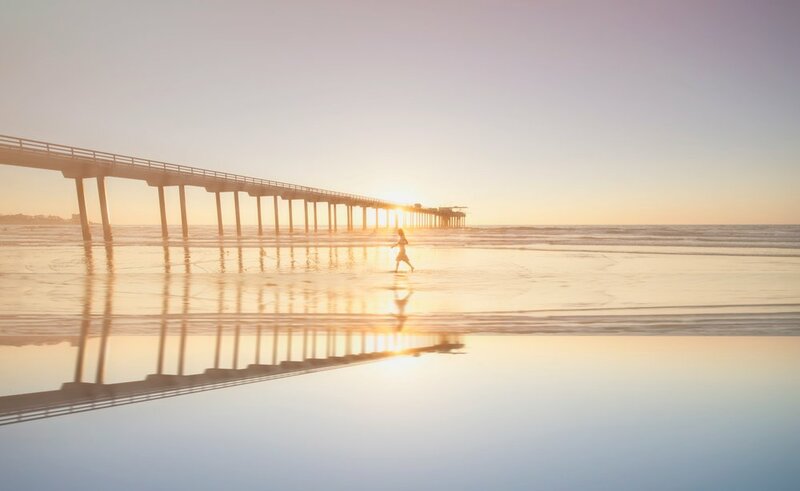 The Pendry if you want a little action, Rancho Valencia for luxury and Loews Coronado Bay if you're looking for a quiet & relaxing trip and/or have no desire to leave the property. Taking our little boat out on the bay, hanging at Marine Street beach, or heading down to the Valle de Guadalupe for a day of vineyard hopping. Any unique exercise/work out opportunities? I like to "hike" Torrey Pines or do a workout in the park - either Kate Sessions or Waterfront Park at the Embarcadero. Make reservations! And not so much etiquette as it is a pro-tip but use Uber/Lyft if you want a stress-free trip to the beach. Finding a parking spot by the beaches on a hot sunny day is no joke. Do you have a local delicacy/food? Where can we find your favourite dish? Hard to choose! But I'm currently obsessed with the Thai Croissant at Herb & Eatery - thai chicken sausage, egg, arugula, & spicy aioli on a fresh croissant. The Pony Room at Rancho Valencia is my little hidden gem. So fun for cocktails and apps after a day spend at their spa. Herb & Wood has lovely atmosphere, as does Kettner Exchange, two of my favorite neighborhood "scenes." And The Little Lion is the sweetest little bistro for a casual yet elevated meal. Yakyudori Yakitori for Japanese skewers, Herb & Eatery for breakfast, Prep Kitchen's late night happy hour. Market Del Mar offering a sensational selection of seasonal dishes consisting of fresh, locally grown, hand-selected ingredients & Addison Del Mar, an elegant European atmosphere with artisanal French cuisine. Where can we find San Diego's best cocktail? I'm biased of course, but You & Yours Distilling Co. Also love Campfire. It's hard to choose so I'll name a few of my favourites; Juniper & Ivy, Vino Carta, The Rose and The Little Lion. All well worth a visit for their wines. The stylish bar at You & Yours Distilling Co.. Photo credit - You & Yours Distilling Co. Probably the little patio tables at Little Lion in Sunset Cliffs. Sitting outside at sunset sipping on bubbles is one of my favorite dining experiences in the city! With daily happy hour until 9pm and a schedule of live music, El Dorado gets my vote. Campfire and Lionfish. Both have beautiful, upscale, modern interiors. Prohibition; wonderful cocktails and they always have live bands - it's a little underground space, super romantic and moody, just the ticket for a late night. Or Vin de Syrah - great music and amazing atmosphere and it's one of those places that never loses it's luster. It's been around for 10 years and is still just as good! Which is your favourite art gallery? I love the Museum of Contemporary Art. It's downtown and just down the street from where I live. For a local gallery their exhibitions are always changing which is great. I'd also recommend visiting San Diego Museum of Art (SDMA) at Balboa Park, the Spanish Plateresque style architecture of the building is beautiful too. Also - just 25 minutes away, across the border into Mexico is the Tijuana Cultural Center, or CECUT. A great place to wander pre-cocktails and tostadas. It's just too easy. The airport is a mere 6-7 minutes away, as is the marina where we keep our little boat. LA is a short drive, as is Tijuana, but everything you need is here. It's such a beautiful spot to come home to. I never get post-vacation blues because we really do live in paradise. It's a hard place to leave.